OAKLAND, Calif. -- As the gold confetti fell and a fresh gray NBA champion cap sat a tad off-kilter on his head, Kevin Durant embraced mother Wanda. Then he moved across the podium and hugged Stephen Curry before accepting his shiny MVP trophy and hoisting it for everyone to see. "It's just a great group of guys, great community, great arena, great fans," Durant said. "I'm just so happy to be a part of it." 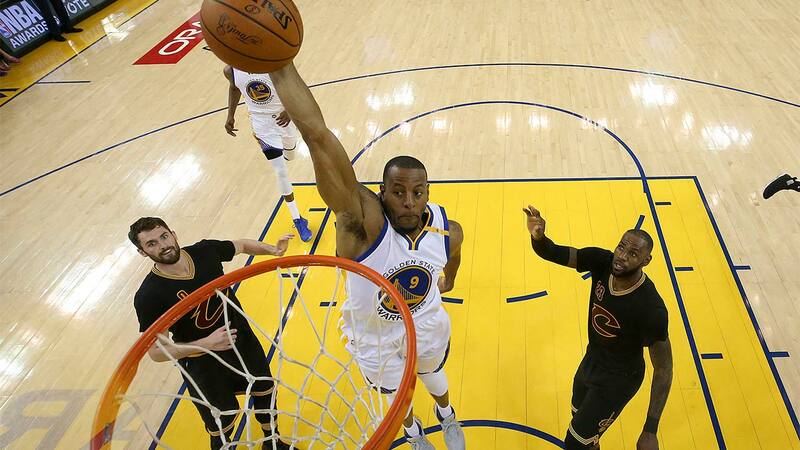 Stephen Curry added 34 points, 10 assists, six rebounds and three steals as Golden State closed out its second title in three years after squandering a 3-1 lead a year ago to the Cavs to miss a repeat. That stung ever since, and even Durant understood, because he gave up the same lead to the Warriors a round earlier with Oklahoma City. "We learned from everything we've been through," Curry said during the trophy celebration. "Our perspective, being blessed to play on this stage three years in a row, it's for these fans, for our organization, for these families. To be back here, bring ol' Larry back home, I'm just excited to do something special. I'm ready to do it again." Kyrie Irving followed up his 40-point gem in Friday's Game 4 with 26 points but shot 9 for 22. "Well I'm not happy he won his first, I'm not happy at all," James said. "... Getting that first championship for me was like having my first son." Draymond Green stayed on the court in a game that featured three technicals on one play 3:08 before halftime. David West fought for the ball with Irving, then they got tangled up and Tristan Thompson entered the fray and he and West went at each other face-to-face. West, Thompson and J.R. Smith received techs after a replay review. During the trophy ceremony, Kerr said, "I want to say a special thank you to Mike Brown and my whole coaching staff." The reigning NBA Coach of the Year returned for Game 2 of the Finals following a six-week absence from the bench. On Monday, Golden State used a 27-4 second-quarter run to take charge - just after it appeared Durant should have been called for a third foul on a basket by James - and got to celebrate right at home in Oakland surrounded by a deafening home crowd waving yellow rally towels and holding up phones to shoot video and photos as the final minute of the clock ticked away. The buzzer sounded and gold confetti began to fall. Durant even hugged James. And that was just the start. Still on the court, he and Curry looked into each other's eyes, did a little shake then slapped hands several times.